Just finished reading this enlightening book. The author is not claiming that Jesus is or isn’t God, but rather is looking as a historian at how the itinerant preacher Jesus of Nazareth became to be understood by Christians as Jesus the Christ, ie, as God. He reviews various Christologies (understandings of Jesus’s nature), including the earliest Christology understanding him as an apocalyptic prophet exalted by God to heaven, the later understanding of him as a divine being, incarnated as human, who became divine starting, depending on the Christology, at his resurrection (as the preliterary traditions of Paul have it), at his baptism (as Mark has it), at his conception/birth (as Luke has it), and the current understanding of him as an eternally preexisting divine being who is equal with God (as the still later tradition of John has it). It’s remarkable how many “orthodoxies” have become “heresies” following Jesus’s death, regarding the understanding of his nature. The long line of theologians whose orthodox views became heretical as theology progressed over time is impressive, including Justin, Origen, Tertullian, Novatian, and many others. 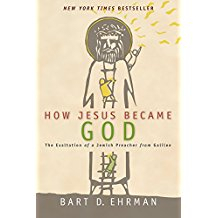 For me, the sad part of all this is the aftermath of Jesus being God, which the author reviews in the epilogue, especially the horrors of antisemitism that arose starting in the Gospel of John when he calls Jews children of the devil (8:44-45), gaining steam in the 2nd Christian century with Melito’s Paschal Homily (see 72-99), and that continues of course to modern Holocaust times, arising from the inescapable conclusion that the Jews killed God.